Tom Carrington's Senior Prank The pictures below are from my High School Senior prank, which involved disassembling two VW beetles and reassembling them inside the library the school overnight! 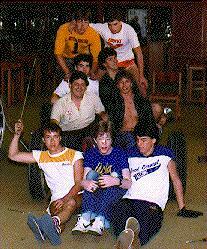 This took place back in 1985, when I was a senior at Good Counsel High School in Wheaton, MD. I was friends with the owner of a local VW repair shop, and when I shared my idea with him, he *gave* me two thrashed Bugs to play with. Sure, we could have done just one...But that would be lame. Did I mention that these pictures are on the *second floor* of the library? Boy, those stairwells were a challenge! Here are some pictures of the cars in the library, the morning after - the school agreed that there would be no punishment if we would remove them. Here is a front view of the 2 Bugs. The red one is a 1967 that looks pretty shiny, but the entire pan and lower body has rusted out. 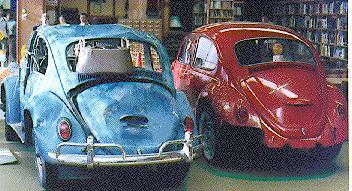 The blue one is a 1964 that was totaled in an auto accident. Pulling back a bit for this photo, you start to notice the tables and chairs around the cars. Yup, the cars are definitely inside! With this shot from behind the Bugs, you can make out some books on the shelves in the background. You may also notice that we had been stomping on top of the blue Bug for fun! And some pictures of us removing them that day. 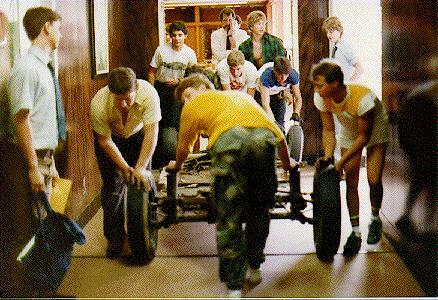 The man looking over the removal of the chassis is the assistant principal, Mr. Murphy. Doesn't he look amused? 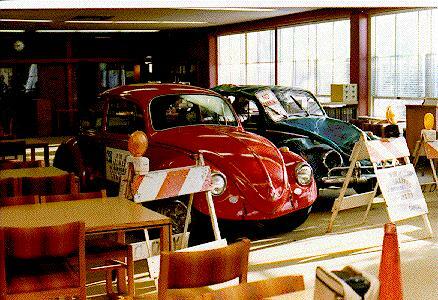 Here is a shot of the body from the blue Bug coming out through the front door of the library. We actually spent a few hours measuring the doors the days before the prank to make sure they would fit! I'm the guy on the left with the brown pants. And how about the libarian? She was a good enough sport to pose for this picture! 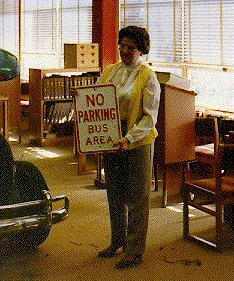 From reading the sign she is holding, I guess the expected us to bring VW Busses, not Bugs! This is the group of guys that got together to pull this off. 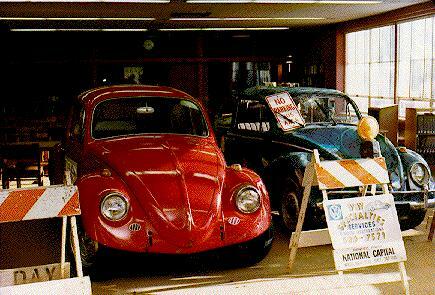 Please stop by soon to see more pictures of my VW's, past and present!